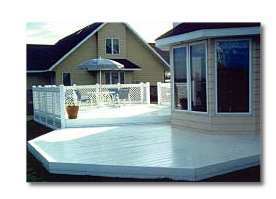 " Vinyl Fencing Systems "
Freedom Fencing's revolutionary deck, railing and porch posts provide durability and beauty that outlast and outperform wood products. Virtually maintenance-free, these home improvements can enhance the value and appearance of your home while providing years of comfort and enjoyment. Freedom Fencing vinyl installations are a snap for the 'do-it-yourselfer' or you can opt for an install by our expert staff. Comfortable Outdoor Living Now you can extend the beauty and convenience of your home’s low-maintenance vinyl exterior. This virtually maintenance-free EverNew™ vinyl deck provides barefoot comfort with a no-snag surface that's free of nails, splinters or screws. It also stays cool to the touch, even when it’s hot! 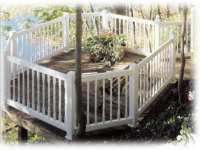 Rails and railing come in two distinct types, home and ranch. 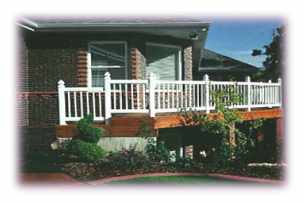 Pictured to the right is the home or residential type of railing that is normally used on proches, stairs and decks, although this type has also been utilized in other applications like small garden or play area enclosures. 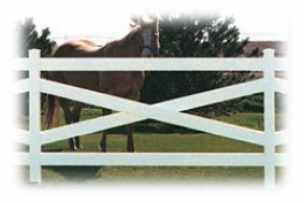 Our Ranch rail system have been utilized in large and small acreage enclosures and comes in several type looks, such as the buck (pictured to the left), open strand or 3 rail systems.